Is it getting Hot, Flat, and Crowded in here? 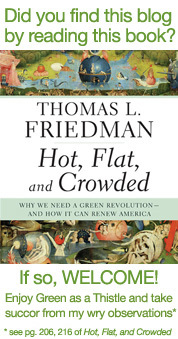 As some of you environmentally minded bookworms may have noticed, there’s now a little addition to my sidebar — a button welcoming all those who found Green as a Thistle by reading Thomas Friedman‘s latest bestseller, Hot, Flat, and Crowded. I have no idea how this brilliant author stumbled upon my ridiculous blog in which I mostly just complain about taking Navy showers in the dark before droning on for infinite paragraphs about my undying love for menstrual cups. Nonetheless, he did, and proceeded to write about my site twice — TWICE! — in his book. In the first mention, on pg. 206, he says he “takes succor” from all the young people in the world trying to do something to better the environment regardless of all the doom-and-gloom talk. And in the second mention, on pg. 216, he talks about how I “wryly observed” the fact that in order to move forward in helping the planet, we have to learn to live with our vices and hypocrisy (such as driving to the farmers’ market or riding your bike to the nearest steak restaurant). Anyway, it was pretty exciting. So for all those intellectuals who are reading this, welcome! I may not use many poly-syllabic words, but I am fond of semi-colons; see, I just used one. Poke around and send me an email or comment. There are 581 mouldy Brita filters stinking up Beth Terry’s dining room, and she couldn’t be more pleased. The 43-year-old accountant will eventually deliver all of these back to Brita, the water-purification company, to be properly recycled — something that’s only possible thanks to a campaign she spearheaded called Take Back The Filter. It took a lot of back-and-forth letter writing and phone calling, numerous posts on her blog, “Fake Plastic Fish,” and over 16,000 petition signatures, but on Nov. 18, Terry finally succeeded. In a press release, the company explained that as of January, consumers across North America would be able to recycle their old filters by dropping them off at participating Whole Foods locations, where they’ll be included along with yogurt lids and other No. 5 polypropylene plastics in the Preserve “Gimme 5” program (those who aren’t near a Whole Foods can mail them directly to Preseve; see www.recycline.com/gimme5). Eventually, the filters will be turned into new plastic products, from toothbrushes and drinking cups to cutting boards and other types of kitchenware. It’s a significant move on behalf of Brita — which is owned by Clorox — because they had recently spearheaded their own enviro-campaign called FilterForGood, using television ads and a website to inform the public about the amount of waste generated by plastic water bottles, and how using something like a Brita filter can produce clean-tasting water without the need for petroleum. It was somewhat hypocritical, however, considering the Brita filters themselves are made of plastic and must be replaced every few months; as well, the only place to recycle them up until now was in Europe. When Terry — who lives in Oakland, CA, and keeps track of all the plastic she purchases and discards as part of her green blog — realized she couldn’t recycle her filter, she decided to email Brita and ask why. In return, she got a standard form letter explaining there was a lack of recycling infrastructure available in the U.S. 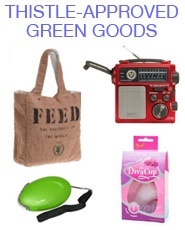 Sometime later, however, when she was checking her Google analytics to see what search terms had directed people to her site, Terry noticed the words “Brita” and “recycling” came up a lot. This prompted her to ask around and see if there was interest in starting a campaign, and so began the process of letters, petitions, websites and meetings with various environmental organizations. And how, exactly, did she end up with 581 used Brita filters in her dining room? So she set up a P.O. Box, but realized she’d still have to store them somewhere, and somehow, they ended up under her dining room table. The reason for the foul odour, she explains, has to do with moisture. In the end, she received filters from all over the place; in fact, after California, Ontario had one of the highest mail-in rates. While Terry never reached the 1,000 mark, this is probably a good thing. It not only demonstrates the efficacy of her campaign, it means her dining room will probably smell a lot better come January. 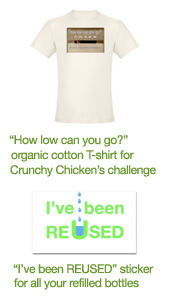 What’s most impressive about the Take Back The Filter campaign, though, is that it began with a single, frustrated woman not knowing how to get rid of her water filter and ended with massive structural change at a multi-national corporation in just months. One might guess Terry, herself, is astounded by such a feat. But she downplays it. Terry — who now chooses to drink plain tap water without any filtration mechanism — believes that what ultimately convinced Brita to make such a significant change probably had more to do with keeping customers happy than saving the environment. “I think they just needed to know that people really wanted it,” she says. General comments: On the “clean” side of things, it doesn’t get much cleaner than ZeroWater‘s 000 rating, which means there are no dissolved solids whatsoever. What’s weird, though, is that I could smell a bit of plastic odour when I poured it out and there was a definite plastic aftertaste. I asked a company representative if the jug was BPA-free and he insisted it was, so at least it wasn’t leaching estrogenic hormones or anything, but after a few days of repeated tasting, I just couldn’t keep it up. Maybe I need to wash the jug with dish soap or something… who knows. Also, while the product was shipped with a fair amount of Styrofoam and plastic wrap (points docked), ZeroWater was apparently the first company to offer a recycling program for its filter cartriges (points awarded). General comments: I’m sure if the fine people at Brita stumble across this post, they’re gonna be all, “Um, hello?! Could you at least have been fair and used a NEW filter?” However, I’m lazy, so the one I’ve got was the one I used, and unfortunately it’s about a year old. Still, despite its age, it managed to get rid of about forty-something parts per million of dissolved solids. Also, there was barely any smell and the taste was perfectly clean — you have to let it sit in the fridge and get a bit cold to achieve this, but hey, not bad. Now, I wasn’t sure what the BPA stats on Brita jugs were, and oddly, when I Googled “Brita jugs BPA”, my own blog post came up as the fourth hit. Yeesh. Anyway, further research seemed to conclude that they don’t leach anything, but what’s really interesting is this article, which seems to imply that the cleaner the water (ie. the lower the TDS rating), the greater chance there is of any BPA or other plastic residues attaching themselves to the water molecules — this might explain why my perfectly clean ZeroWater still tasted like the plastic jug. Finally, on the sustainability front, although I wish Brita made stainless steel containers (HELLO? BRITA? ARE YOU LISTENING? ), my plastic one has lasted for years without a problem and the company is apparently going to start taking back its filters for recycling. General comments: First off, can I just complain about the ridiculously high cost of this thing? The filter system and cartridge cost a whopping $175 all together, and honestly, with a TDS rating that’s higher than my crappy old Brita filter and a taste and smell that’s certainly good but also identical to the Brita water, I really think the price tag is kind of insane. Also, I have no idea if I can recycle the cartridge. I understand that the unit is definitely BPA-free and it’s nice that the water goes in and out of it right away without sitting there, but the unit itself looks pretty ugly and I’m just not convinced it’s doing a better job. But hey, water tastes fine. General comments: I was pretty impressed with this TDS rating — for some reason, I thought it would be more in the 400-range — and of course, you can’t get more eco-friendly than drinking straight from the tap. That said, I’m not sure what the fluoride and/or chlorine content is in my city water, and while I try not to be snobby about it, the taste is just kind of gross. I tried letting it sit in the fridge in my Sigg bottle for a bit, but that didn’t really help. It’s obviously way better than most of the world’s drinking water and for that I’m thankful, but it definitely has a metallic taste. As much as it pains my anti-corporate and anti-petroleum soul, I’m going to have to go with Brita on this one. If they’re jugs are, in fact, BPA-free and if they do actually start recycling their filters, I think the sustainability angle is pretty covered because their products last a long time and even a beaten-up old filter still manages to accomplish a lot in terms of reducing taste and odour. The carbon system is a close second because it’s just as good with taste and smell, but I’m not completely sold until I find out whether I can recycle the filter. And finally, I have to say, as much as the plastic taste was driving me crazy when it came to the ZeroWater jug, it technically wins hands-down for most effective filtration — and, I wouldn’t have been able to do any of these TDS tests without the cool meter it comes with (which I highly recommend getting). You are currently browsing the Green as a Thistle blog archives for December, 2008.